Here's what you do Friday, August 17, 2012. 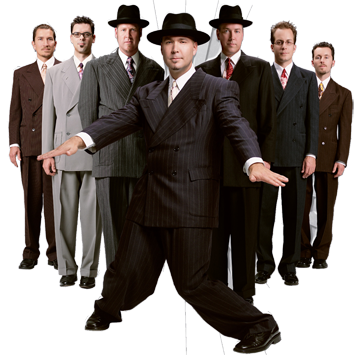 Big Bad Voodoo Daddy on Friday Night at Chastain. Yep. That's Jon Favreau and Heather Graham in Swingers. Jon's blossoming moment, when Vince Vaughn and the fellas find out he can dance. And all brought to you courtesy of Big Bad Voodoo Daddy. Go Daddy-O! So don your zoot suit or your swishy skirt and head on over to Chastain tomorrow for some very cool fun. Living social has a deal going for it. $25 man. Check it out here. The show starts at 8. Get there at 7 to set up your picnic, have a mint julep, and settle in. Want some tunes to get you in the mood. Check out this playlist on Spotify. First: Try out Ria's Bluebird in Grant Park. Sit at the counter, order a cup of coffee, and get the weekend special. Shrimp and Andouille benedict with tomatoe creole sauce. Mais oui! ($10 per person). Second: Sky Hike at Stone Mountain. 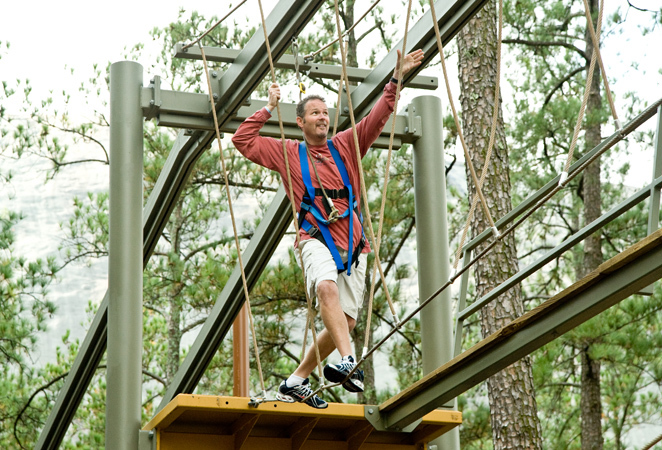 The ropes course is awesome. They have three levels, high (12ft), higher (24ft), and insane (40ft). Go insane! And enjoy the great outdoors at the same time. $14 per person. "People often call us Texas Style Bar-B-Q. 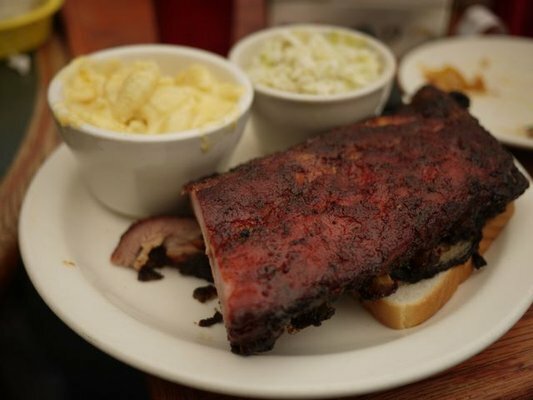 While we are from Texas originally, we prefer to call our style of Bar-B-Q Southern, or a mixture of “where we are from and where we are at.” It has Texan roots but has a southern influence. We cook all of our meats low and slow with Hickory wood. We cook at temperatures ranging between 200 and 230 degrees. We cook our meats, fresh daily, and on occasion, we will run out of certain items. We make every effort to not run out but on occasion we will. But if we do run out, you can bet your last dollar that we will have more the next day!" Have a half rack of the baby back ribs man, and a cold beer. Sweetwater 420 is an excellent choice. ($15 per person). Have some ribs at Fox Bros for lunch. Fourth: Take a nap man. Recover from the ropes and ribs. Follow the perfect bed rules. Fifth: Ok. Gotta get ready for BBVD. 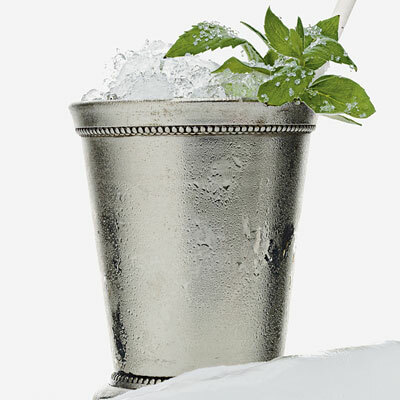 It feels like a mint julep kinda Friday. Check out this recipe from Sara Moulton's Kentucky Derby recipe. Get the Juleps ready and pack into a picnic basket a baguette, some cherries, some charcuterie, and some smoked gouda to munch on. For charcuterie, go to Atlanta's best kept meat secret, Patak in Austell. It's kind of a hike, but totally worth it. Try out the Hungarian and Russian Salami. Yummy! ($50 for dinner, $25 per person for the tickets). Mint Juleps are the perfect drink for Big Bad Voodoo Daddy. Note. Patak is more of a once a month kinda trip, to stock up on excellent, excellent meats. Do the Patak trip another day, so that you don't find yourself driving all day on Friday. Finally: Go Daddy-O! Big Bad Voodoo Daddy baby! ($40 for a terrace seat. $25 if you use Social Living).